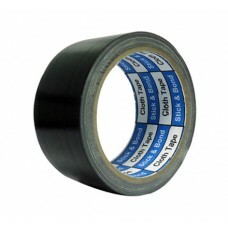 Cloth tape is a high quality polyethylene laminated adhesive tape made with a cloth backing to make it durable and flexible. It provides a good workability and vapour resistance. Ideal for heavy weight packaging, sand blasting, jointing protection sheets, bandages, sealing walls, electrical and plumbing tasks and are ideal products for temporary repair applications too. They can bond to rough surfaces and be removed quickly and cleanly after use. Cloth Tape is commonly referred to as Duct Tape, Gaffers Tape, Spike Tape, Carpet Tape, Medical Tape, Athletic Tape, Glass Cloth Tape, Binding Tape, Friction Tape or Hockey Tape.